Ideal Christmas, Birthday, Valentine's Day Gift for Boys, Girls and Adult Alagoo Mini Talking Robot Toy with 11 Posable Joints and Flashing LED Eyes Repeats Whatever You Say. Singing, whistling or whispering to him, and he'll echo every sound. 360°rotation electric robot including light & mimic your voice electric robot model toy. Turn the robot on and tap him high on his forehead, between his eyes (before you press the button a second time for mode). Perfect Gift for CHRISTMAS or BIRTHDAY. What Power This Talking Robot Toy? 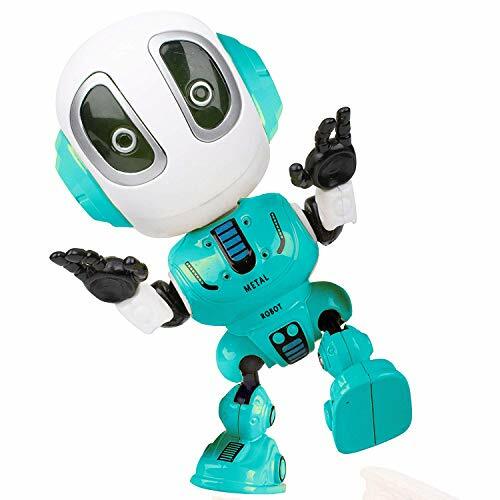 ♦This toy robot comes with 3 LR44 1.5v button-cell batteries. After the batteries run out, just need to change them. Hard Metal Material, NOT easily to be broken ♦This strong mini robot toy is crafted in die-cast metal, so it is a tough robot toy - mighty durable and adroable for children. Package includes: Alagoo Mini Repeat Talking Toy Robot (Pre-Installed 3x LR44 1.5v Button-Cell Batteries) Welcome to choose Alagoo Talking Robot! If you have any puzzle about the item, welcome to contact the seller support. We are waiting here to help you. Thanks a lot and best wishes.